Stay in your own cosy geodesic dome set among the trees in this eco-friendly camp, with stunning sunset views of the towers. A laid-back, convivial atmosphere makes EcoCamp a great place to relax after a day hiking, trekking, horse riding or puma tracking in the park. Fall asleep gazing at the stars through your dome skylight! EcoCamp's treks and wildlife tours take hikers to all corners of Torres del Paine National Park. Expert guides lead the way through ancient forests and Patagonian steppe, pointing out the snow-peaked Paine massif, lakes, rivers, glaciers and exquisite wildlife along the way. As well as day hikes, including the most famous treks into each of the three valleys, EcoCamp lead the W and full circuit treks over five or seven days. Starting and finishing at the camp, you can trek the iconic routes of Torres del Paine. EcoCamp is the only accommodation in Torres del Paine that offers horse tracking – horse riding to track baguales (wild horses) with a horse expert. Join the ranks of the local “baqueanos” cowboys for a day of riding across the grassy pampas of Patagonia, luxuriating in the fresh air and stunning views, and learning more about the fascinating cultural history of the region. Take in the highlights of Torres del Paine over several days on foot, on horseback, by bicycle and by kayak. On these excursions, each day brings a new adventure as you head out into the Patagonian wilderness for a different activity. The Patagonia Puma Tracking Photo Adventure is a one-of-a-kind nature exploration program focusing on the park's native wildlife, distinct ecosystems and spectacular photo opportunities across the Paine massif. A wildlife and photography expert takes you to the best-hidden spots to capture sightings of rare species, such as the endangered huemul and the elusive puma. Ecocamp has extraordinarily good food and were amazing about accommodating dietary restrictions. We wish we had spent more time there just for the good food! Highlight was ecocamp and our guide for the trek there. The food at ecocamp far exceeded any other food we had on the trip. Amazing vegan options at every meal. Ecocamp was incredible and again this was a Swoop suggestion that we probably wouldn’t have thought to do! Loved our suite dome and we are so glad we upgraded here. Heard people talking about the standard domes and shared bathrooms, and were glad that wasn’t us! Food, drink and service at ecocamp was exceptional! Francesca - one of the guides - was especially lovely throughout our whole stay! The EcoCamp was fantastic. The accommodation was great - unique but luxurious - and the community atmosphere made for a really special trip. Our dome suite was wonderfully clean with firewood arriving daily in a timely manner. It was a once-in-a-lifetime experience. We'll never forget it. Overall, my experience was wonderful. The facilities were a perfect mix between comfortable and unusual. The location was unbeatable, with excellent hiking nearby. Fabulous location with amazing views of Massif and Torres and brilliant sunrises. The food was, unexpectedly, utterly amazing - the range of choice and inventiveness of the menus was superb. The EcoCamp was amazing - I had no idea that it would be so wonderful. The highlight was Eco Camp, a great eco friendly place to stay, the food was amazing! The landscapes were beautiful, the people were friendly! Eco Camp was wonderful - the food was fantastic and all the staff were so friendly and accommodating. We had great guides for our trek and loads of fun! Eco-Camp did a brilliant job; thanks for helping to make this one of the best holidays ever. EcoCamp is situated a short walk from the trailhead of the base of the towers trek. The geodesic domes have panoramic views of the towers, which turn warm shades of orange and pink as the sun sets behind them. The atmosphere at the camp is very relaxed and sociable, with areas indoors and outdoors to hang out and unwind after a day of hiking. Domes are immersed in lenga forest, dotted around the site and interlinked by wooden walkways. They are made to resist the Patagonian elements and have ceiling windows to look up at the starry night sky. Standard domes offer more basic accommodation but are cosy and snug. Superior and suite domes are larger, with private bathrooms and heating. Suite domes lofts have even more space and a mezzanine level with an extra bed, so they are perfect for families or groups of friends. 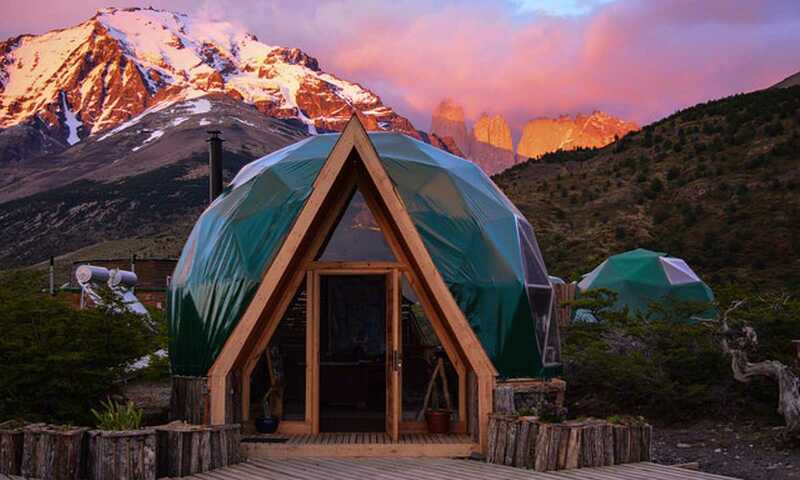 Located in the heart of the park and surrounding wilderness, EcoCamp is an ideal place to practise yoga and connect with the magnificent Patagonian landscapes. The yoga dome hosts daily group yoga sessions in the morning and early evening. Private classes are also available. The latest addition to EcoCamp is a massage dome. There is an onsite massage therapist who offers a range of treatments for guests. This cosy pod-like structure provides the ultimate relaxation with views out over the park whilst maintaining complete privacy. Massages can be booked at an additional cost. EcoCamp, the region’s first fully-sustainable travel accommodation, has gained an award-winning reputation for its eco-friendly policies. It minimises the footprint of visitors in Torres del Paine National Park through its implementation of green technology. The camp is focussed on energy efficiency, but the little energy that is used onsite is generated from 100% renewable sources - a micro-hydro turbine and photovoltaic panels. Electricity is limited and only available to guests for charging camera batteries and laptops. Composting toilets, and bringing as little paper, tin and plastic into the wilderness as possible, are all ways the camp reduces its impact on the environment. All waste brought in is recycled. The camp uses local products and employs staff from the area in its social commitment to the region. It is also a supporter of the Legacy Fund, which runs projects that improve the environment, the community, and the tourism in Torres del Paine. I enjoyed the most stunning sunrise of my entire month-long trip from the door of my dome at the EcoCamp – the three dark silhouettes of the towers backed by bright pink and gold skies. The views from EcoCamp will blow you away. Standard domes come with comfortable king-size or twin beds and can be booked on a sharing basis. If you are a solo traveller, you can share a dome with another traveller of the same gender. Standard domes have shared bathrooms, which are large, comfortable and gender divided. Both male and female bathrooms have showers, with hot water, ample space to dry yourself and put on clothes, composting toilets and hand wash basins. There is no electricity. * Original rates are in Chilean pesos. These prices are approximate based on the exchange rate at the time of pricing. Each superior dome has comfortable queen-size or twin beds, a propane heater in the bedroom, and a private bathroom with a state of the art composting toilet. Electricity is very limited inside the domes, meaning hairdryers are not permitted, but laptops and cameras can be charged. Superior domes (23 mt² / 250 ft²) are larger than standard domes. Each suite dome has comfortable king-size or twin beds, a modern low-emission wood stove in the bedroom, and a private heated bathroom with a state of the art composting toilet. Electricity is very limited inside the domes, meaning hairdryers are not permitted, but laptops and cameras can be charged. Suite domes have an open terrace for sitting out on, with an enclosed porch to hang wet clothing. Suite domes (28m² / 300ft² ) are larger than standard and superior domes. Suite dome lofts are two-storey suite domes, which sleep up to four people and have comfortable king-size or twin beds upstairs and twin beds downstairs. 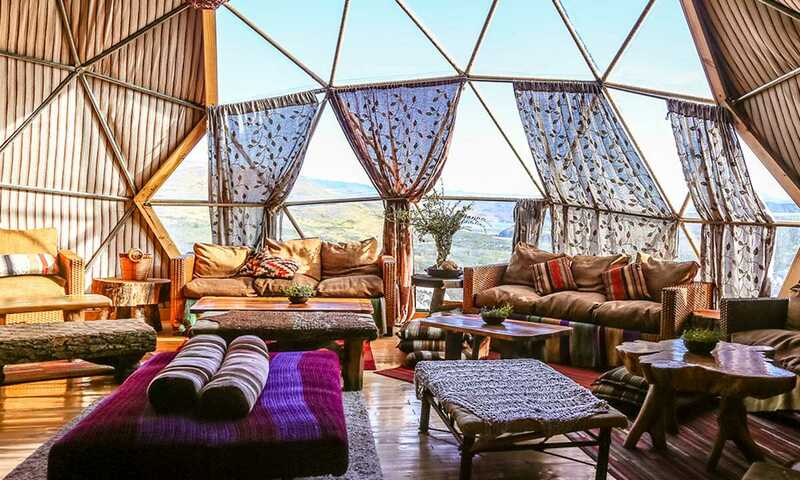 These domes, ideal for families or groups of friends, have the same amenities as suite domes and are the largest domes available (37mt²/398 ft²) at EcoCamp.